Although Transformers actor Shia LaBeouf won’t be returning for the Hasbro franchise’s inevitable fourth onscreen outing—and neither will director Michael Bay—the 25-year-old actor is planning to reprise the role of Mutt Williams in a fifth Indiana Jones film. 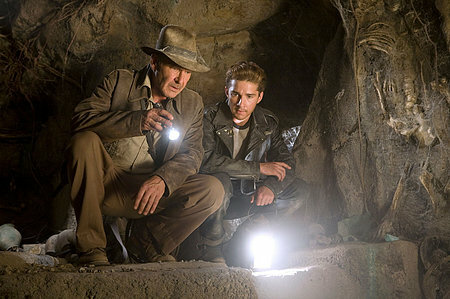 In an interview with MTV promoting Transformers: Dark of the Moon at the 2011 MTV Movie Awards, LaBeouf said that a sequel to Indiana Jones and the Kingdom of the Crystal Skull “is not so far off,” and that series’ veteran star Harrison Ford is staying in peak physical condition for when he is called upon to don Indy’s trademark fedora and leather jacket once again. Let me come right out and say it. Yes, I was very complimentary of Crystal Skull when it was originally released. Maybe I was riding high on the incredible wave of Indiana Jones nostalgia that had overtaken many of us the summer of 2007, but I didn’t want to believe that Lucas, Spielberg and Ford had screwed up. Unfortunately, I bought the DVD later that year, and came to realize that Crystal Skull didn’t need to be made and never justified its existence with a compelling narrative. Nowadays, I can’t watch it for more than 20 minutes before I feel the need to turn it off or change the channel. Bellyaching aside, LaBeouf as Indy’s rebellious son was the least of the film’s problems, so his return to the series doesn’t bother me in the slightest. I’m more bothered that Lucas and Spielberg think they have another Indiana Jones tale worth telling. If the last film is any indication, as Indy himself might say, this franchise belongs in a museum.